Welcome to the Jacob T. Walden House! Native settlements sprinkled the banks of the Wallkill River and shared this scenic spot atop a 40-foot waterfall with our early ancestors. Your family history, if you were born in this historic area, more than likely melts into one of the long lines of many early immigrant settlers. The house built around 1768 is a fine example of Hudson Valley Dutch Colonial architecture. It is constructed of cut stone and has walls about 2 feet thick, which is indicated by the depth of the window sills. The house is situated on land that was originally part of the Gatehouse patent land grant. 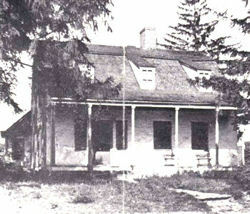 It is believed that Samuel Erwin and his heirs enlarged the original home by adding this stone structure to a smaller frame house that no longer exists. In 1813, wealthy New York City shipping merchant, Jacob Treadwell Walden, purchased a home from the heirs of Samuel Erwin, (during the time the village was called Kidd Town) and moved his family here. He built textile mills powered by the Wallkill River and Falls. He also purchased many plots of land near the falls on both sides of the river. The Jacob T. Walden house is located on North Montgomery Street, out of view but well within earshot of the raging "High Falls." The village was officially renamed for him in 1855. This stone house is made from local shale and limestone blocks and still has the original Dutch double front door. It became one of the first Walden structures to be proudly named to the New York State and National Register of Historic Places. 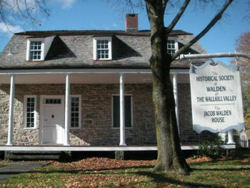 The Walden House is now the home of the Historical Society of Walden and Wallkill Valley. 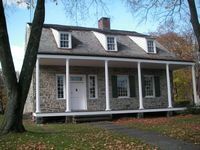 The Historical Society of Walden & the Wallkill Valley owns and maintains the historic home that Mr. Walden referred to as "Old Hearthstone." It is as we feel Mr. Walden might have furnished his home when he moved here from New York City, but none of the furnishings in the house belonged to the Walden family. A more recent view of the other side of the house as it looks today. Comments, corrections, and additions are welcome.